My mom gifted me with lots of things in my youth: flute lessons, bassoon lessons, piano lessons, ballet lessons, the old Nissan Stanza, her recipe for beef stroganoff, a deep loathing of my body, a fondness for the ocean. Human nature being what it is, however, I’ve also decided that my parenting should compensate for certain things my childhood lacked–I should, in this round of fetching ’em up, make recompense for the Things Mom Never Told Me. 1) The ultimate in outdoor entertainment is not acting out the Donnie and Marie show on ice skates. It’s also possible to be a little bit outdoorsy, a little bit country, and quite a bit rock ‘n roll while doing things like grilling pork or rolling old tires through the garden. 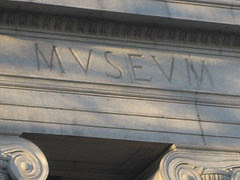 2) When you see the letters “MVSEVM” chiseled into an old building, it’s not actually pronounced “MUV-ZEE-VUM.” Instead, them is old-fashioned letterings for “MEW-ZEE-UM,” which is where The Smartie Richies keep the dinosaur bones and gold. Now git in there and fill up this bag. Mama’s collection needs an Allosaurus furcula! 3) In sixth grade, when the father of one of your classmates comes to the school claiming to be a “scientist” and gives the assembled eleven-year-olds a presentation about the mystical powers of pyramids–having you hold your arm up and out to the side while he pushes on it…and then having you hold it up and out to the side while holding a little pyramid in your hand only to discover he has a distinctly-more-difficult time pushing on it–feel free to mess with him and start hollering, “My arm! My arm! That big man hurt me when he pushed so hard! The tip of the pyramid pierced my ligament, and now I think I need to skip the Presidential Physical Fitness Test today, except maybe the Standing Broad Jump, which doesn’t so much involve arm ligaments!” If you need to bump up the drama from there by taking your little show to the nurse’s office and having her call me, I promise I’ll come pick you up in my two-toned station wagon. Meet me out front by the big grey boulder. I’ll slow it down to 10 mph; you and your pierced ligament can hop through the open window. 5) When an ad tells you a new deodorant is “revolutionary,” that doesn’t mean it comes packaged with a musket. 6) Chlamydia is not a rare orchid. Despite wishing I’d been armed with these nuggets of knowledge earlier in life , I do have to give my mom a hugenormous shout-out for handing me one of the best pieces of advice ever: Always bleach naked. The other night, as always, I forgot to heed her wisdom, and I unscrewed the cap of the Tide Bleach Pen fully clothed. My intent was to turn the Girl’s pink and white winter coat back to, er, something like pink and white. A winter full of slamming that coat against a dirty jungle gym (dirty jungle gym antics are also a moonlighting gig of mine, incidentally) has rendered the thing dingy, crusted, and leathery. What better, Rapt Readers, than a careful whisk with a Tide Bleach Pen, a thorough soaking in Oxyclean, a deep rinse in Borax Mule-Team Brightener, plus another soaking in Oxyclean to transform it into–crap on a cracker–a garment that is only minimally less dingy, crusted, and leathery? At any rate, I was optimistic, but not nekkid. Poorly played on my part. More frankly, it sits in a plastic bag. 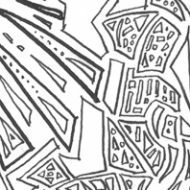 Wouldn’t it be something if I were the type to make a label? 1) Draping it over my poo mounds in the woods, thereby making my natural heaps look twenty-seven times larger and infinitely more intimidating (or enticing) to passing snowmobilers and bike commuters. 2) Using it to strain vermicelli as the noodles hover on the precipice of al dente. Of late, our colander has been taking up too much room in the cabinet, elbowing the pots and pans quite aggressively. But a speckled hoodie is passive–infinitely adaptable to space. I could crumple the thing and store it inside the food processor, alongside my stash of Robitussin. 3) Stuffing it down the throat of the kid who called my Niblet “fat” and “ugly” last summer. Brown is the new gag. 4) Gently wrapping my new boxed set of My So-Called Life in it and burying the whole thing in the backyard, under a full moon, sacrificing a squirrel and incanting the 14-year-old Claire Danes to star in at least eight more episodes before growing up and dating that wanker Billy Crudup who, for Claire, abandoned the knocked-up Mary Louise Parker (little-known fact: the sound of her water breaking masked the little snapping sound a heart makes as it breaks). That’s all my cardigan and I want: just eight more episodes with teen-phenom Danes and a chance for Brian Krakow to go to prom with Angela Chase. 5) Cloaking Barack Obama in it to make him more appealing to African-American voters. Between Ofrey’s endorsement and my sweater’s browning abilities, he might just convince them he’s black. Plus, his wearing a woman’s sweater would clearly signal that Obama is unafraid to bring change to the White House. Should none of these alternate uses take hold, I can, of course, always take my mother’s other piece of clothing-related advice: when in doubt, give it to your daughter and make her wear it. Bleach naked – Good one! Sorry, I was interrupted – I mis-read as ‘belch naked,’ which I think might be just as good advice! FIRST: OMYJEEBUS YOU ARE FUNNY! Your mother is a smart woman. I ruined my favorite pair of capri pants last summer with an ill-timed bleach splash. I know, I know, a woman with my configuration should never ever wear capri pants, but that’s beside the point. Oy! The number of outfits I have ruined with an ill-times bleach pour. Just last week I got the sleeve of a track suit jacket. Good thing it was an old one and I just don’t care. Otherwise I might cry. Besides, I don’t have any pasta that needs straining right now. Yes, please, do the Obama thing! You hooked my attention with “Do it Naked” and then you assail me gems of wisdom. Dagnabit, you fooled me into learning things. Maybe modern education in schools could try this tact. I SO get this! I ruined a new shirt on Day 1 of wearing it when a bleach cleaner spray bottle backfired somehow on my red (now with white speckles) shirt. And I just spent $$$ on an organizer who helped me LET GO of all those things my mother gave me! Well, most of them. so are you trying to make me love you or what? You could always give it to Michael Jackson – natural camo ‘n’ all that. Oh lady, you is truly funny…. I am simply impressed that you own all those chemicals. And do laundry. Sounds like a perfect ‘Saturday morning’ sweater; throw it on while you are doing laundry– post coffee, pre leaving-the-house. Lucky you to have a mom give you that advice. I learned to bleach naked the hard way. You make my little inadequite housekeeping heart go pitta-pat when you related that all the laundry products in the world failed to make your Girl’s parka more than minimally less grungy. My son’s formerly safety-yellow parka could be her parka’s mate. From now on, there will be no parkas in this family purchased that are any color than medium brown streaked with gray and flecked with black. Of course, my resolve will flit out the window come next fall and the kids will be arrayed in light coats with white trim. I find if you bury the disasters under a few items of relatively wearable clothes in the unlabeled trash bag, it delays their discovery of the unwearable cast-off long enough for you to be safely down the road and out of reach. Advise: always keep a set of permanent markers with colours matching all your favourite clothes. Its magic what they can hide! Damn, and I’ve been mispronouncing museum ALL this time??! No wonder they never let me in. And the whole buy me more baubles and art instead of saying I love you? VERY good call. I wish I’d tried that, oh, say on my first 7 loser ex’s. Is there is statute of limitations, perchance on that nugget? that’s a rule i always regret when i fail to follow it. i also always tie dye naked too, well, ok, maybe i wear my skivvies and rubber gloves….ok, i’ll stop now because i just know some pervert out there is getting turned on by a tied dyed body clad only an d a bit of polyester and latex….my mother always told me not to encourage those types. i haven'[t always listened so well either. what about when you clean with bleach? do you strip for that, too? So what’s chlamydia then? It’s not a plant? I was wondering why I got punched the other day when I asked the woman at the flowershop for some. you are a pillar. a pillar to us all. I have a mug that is heat sensitive. when it’s cool it’s white, when it’s hot the words “Clyhamidia (whatever i can’t spell it” Happens”…I only use it in the most special meetings. Nugget number two (MuvZeeVum) is too much. YOU’RE too much, Jocelyn. What a bout of the giggles you’ve given me. No one ever told me to bleach naked. It’s a very stressful situation otherwise… Mama Crisis is very clever. And thank you dearly for the get-well note. Just got your second note. What the heck are you doing up at this hour? It’s well past midnight where you are! … All is well, finally. Very glad to return to your blog. Chlamydia is not a rare orchid? No way. Are you sure? Please meet me at the MUV ZEE VUM to discuss this because it changes everything. Do the poo mounds in the woods actually deter snowmobilers? When I lived on Lake Minnetonka, they aimed for my skating children all winter. At the very least, it would have been nice to have some frozen poo to throw at them. I feel I shouldnt be reading this as, so far I’m not a mother or, indeed, female. It’s like all that speculation about the fairer gender were not as outrageous or sinister as our little male brains suspected. This is so funny. One piece of advice I learned is that a marriage proposal linked with financial bribe (I’m going to inherit those millions some day, come on!) is good for an engagement of about one week. Naked chores? Cleaning the shower, too. And just give up on the winter coat. It’s hopeless. So very funny. May I suggest a visit to the Sur la Table website for a collapsible colander? It will leave far less fabric in your pasta. I think that when I was a child it was my dad that would have liked to tell me at the MVSEVM to “git in there and fill up this bag”. Then my mom would shush him. Good lessons all, except the loathing for your body one. Once I picked up a bottle of prewash stuff and squirted it on a favorite T-shirt only to discover what I was actually holding was toilet bowl cleaner with bleach. Well, what could I do. I made lots more squiggles all over it, washed it and had a nifty new tie-dye-like T.
I’m going to start buying a lot more bleach for my hot female friends.